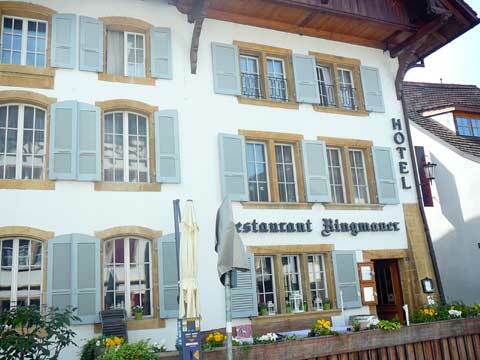 The Hotel-Restaurant Ringmauer in Murten / Morat is a charming two-star hotel located in an ancient building near the old defensive walls of the old town of Murten, a five minutes walk from Murten train station. The Hotel-Restaurant Ringmauer in Murten / Morat offers simple comfort for value in rooms that include sinks, free Wifi and shared bathrooms and showers. Some upgraded and more expensive rooms include TV and private bathrooms. In their reviews, guests of the hotel indicate that they liked the location and the friendliness of the staff, but warn that you have to be aware of the fact that bathrooms are not inside the room for most of them. The hotel has also a restaurant that is open from Monday to Saturday and has a nice terrace and garden for the summer. The restaurant Ringmauer offers some simple bistro cuisine with some vegetarian plates. Its wine list is interesting with a nice set of Swiss, French, Italian and Spanish wines. Rates for rooms: from 65 to 215 Swiss francs. The price of the breakfast(18 Swiss francs) is not included, which is unusual in Switzerland.